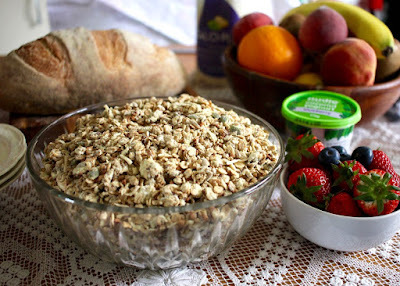 Muesli (or granola as it is called elsewhere) has been part of my life for a long time. I didn't always make it. When I was young we bought it in a packet. I ate it with milk. Ever since I have gone through phases of eating it. Sometimes with juice. Sometimes with yoghurt. Occasionally at a breakfast spread at a hotel. The above photos was inspired by a second hand glass bowl from an op shop that reminded me of a hotel breakfast buffet. Recently I have enjoyed making my own museli. While my favourite is my chocolate muesli, every now and again I fancy a change. With manky bananas in the fruit bowl and a curiosity to try maca powder, I embarked on a new flavour. It has pleased me very much over a month of breakfasts and I would highly recommend it. Sylvia and I had fun when I first ate it. We sang "I like banana, coconut and oats and that's why they call me king of the goats." (This is a riff on a playground chant in one of her books that goes "I love banana, coconut and grapes and that's why they call me king of the apes.") Kids are so easy to amuse. Sadly, they are harder to coax to eat muesli! No breakthrough there! It is all mine. My main uncertainty about the muesli was how to use the maca. I had a feeling that it would marry nicely with banana and I liked the idea that it gave energy for the day. Then I read I should not cook it. So I toasted the muesli and added a cup of maca. My lovely toasted muesli went all powdery. But I ate it anyway. I liked how it smelled like banana cake when I opened the canister of muesli every morning. Until I had been eating it almost 5 weeks and then it didn't smell quite so good and I lost confidence in the freshness. I think the maca would have been better in the toasted muesli rather than added afterwards but am still not sure if this would affect the maca's potency or muesli's shelf life. More experiments and yummy breakfasts to come. Place everything in large bowl and mix. Tip into two large lined roasting dishes and baked for 30 minutes at 180 C, stirring once or twice during the baking. It should be golden brown. Cool in the tin and then store in an airtight container for about a month. 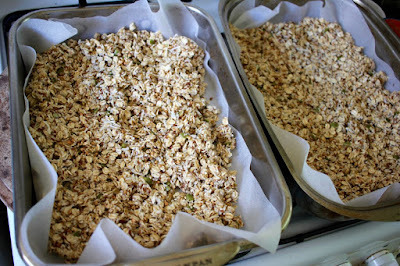 NOTES: For the seeds I used a mixture of sesame, sunflower, pumpkin, linseed and chia. For the oil I used rice bran. I added my maca after I cooked everything else but I would try it in with everything next time, though it may need a bit more liquid. For those who are confused by terminology, in Australia we have always called it "muesli" rather than "granola" which is used elsewhere! This post is part of the Vegan Month of Food (Vegan MoFo) in November 2016. 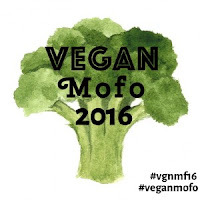 Go to my Vegan MoFo list for more of my 2016 Vegan MoFo posts. 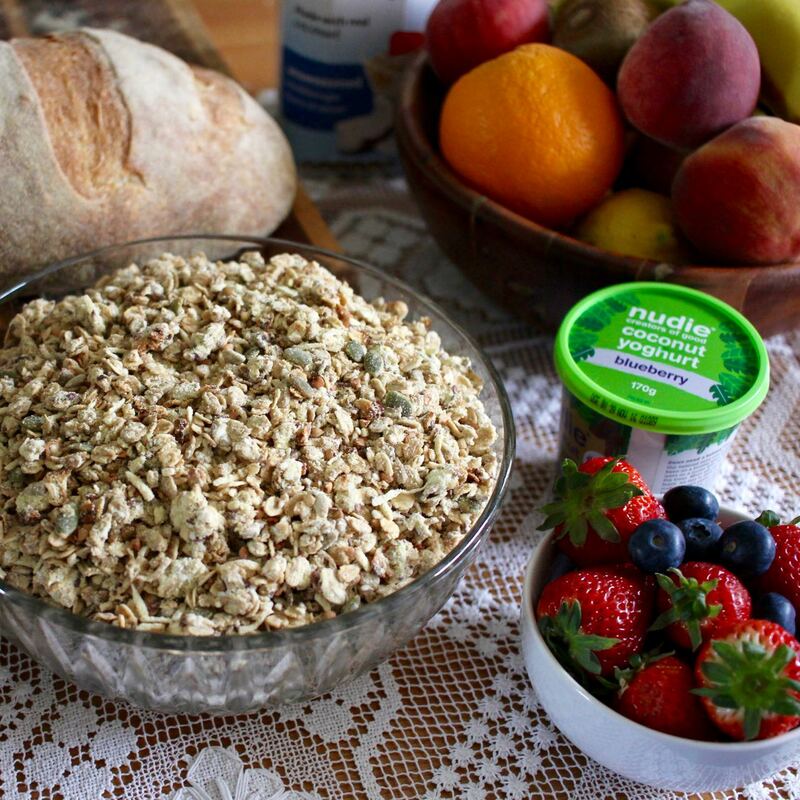 Homemade muesli is tasty and you know what goes in it. This one sounds good! I love making muesli/granola blends at home - so much better to be able to cater to your own tastes. I make some baked granolas, and sometimes for kicks I put cacao in them so that I can have chocolate for brekkie! I haven't tried that Nudie yoghurt yet - is it nice? Ooh banana bread granola has a nice ring to it! But I guess it does have a shorter shelf life using real bananas. I was wondering just this morning whether there was any difference between museli and granola, so now I'm glad to have the question settled! Anything that tastes like banana cake sounds alright with me! "(And did it give me energy. I only noticed at one point I did not eat muesli for breakfast and was decidedly lacking in energy for a couple of days but I think that was more due to Trump being elected and me being laid low with a headache!)" The song you and Sylvia sang is cute - too bad she didn't try the muesli, I feel like she would like it.